4 How the Stones Were Brought? The world is full of mysteries and amazing things. There are seven wonders of the world as everybody knows. Each one is associated with one country or civilization. The Incas, Mayas, Aztecan, Nile, and Indus Valley all are associated with some kind of mystery or the other. Each civilization has stamped its own identity out beating each other with marvels and wonders. 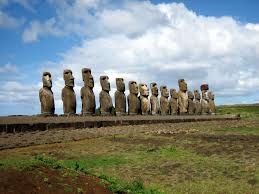 One such amazing thing is the statues of Easter Island. Eastern Island is in the west of Caldera in Chile and has a low population when it was discovered by Catherin, a British lady, during 1914-15. The Island is known for mysterious statues of remote and unknown origin. These statues, consisting of giant heads facing inland, fringe the Island’s coast line. Their height varies from 3-36 ft and weight up to 20 tons. More than 1000 statues have been discovered so far. These statues are called Moi. The biggest head of them is 32 ft long and weighs 90 tons. So far no one knows who built them. In some of the recent opinions these statues were constructed by Polynesian. There are many evidences which show that inhabitants of Easter Island constructed these statues during 1110 and 1205 and also up to 1650. At that time this island was ruled by a group of Tribal people. How the Stones Were Brought? The wonder is that how such big stones were brought to this Island is still a point of discussion among many historians. Each have got their own opinion. However, there is unanimity of opinion to accept that the Stones which were used for the construction of these statues were brought with the help of tree stem sledges. It is estimated that population at that time would have been about 20,000. 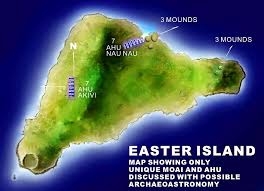 The historians say that, the inhabitants of these islands could not have carried these heavy stones up to a distance of more than one thousand feet in the course of a day. They would have made them by using wooden frames. Even then, the historians are unable to explain as to what made the people to go for erection of such big statues? Do they signify any deities? Do they have any treasure inside them? Why they are all on the fringe of Coastline? Were they constructed for the purpose of sailors for easy navigation and location of the Island? Nobody knows.